Renew Car Insurance with Liberty General Insurance (previous known as UniAsia Insurance) in this site is easy. Simply complete the form below and submit to us for an official quotation. Take your time to evaluate and make a decision. 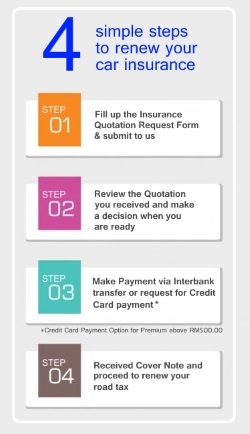 If you agreed to the quotation, proceed with payment as contained in the email communication and you will receive your e-cover note which has also been updated to JPJ system. Proceed to renew your road tax via MYEG, Pos or JPJ offices. Upon submission of the form, you will usually receive the quotation within 15 minutes (during office hours). On weekends or during the night, we will also process your request for quotation.